Summer moves fast at UC Davis! Take a short tour of Shields Library to be at the top of your academic game. Find the best places to study and where to go for research help. 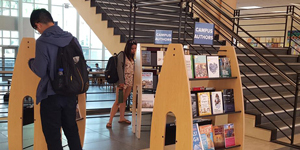 Perfect for anyone new to campus or who wants a refresher on library services and resources. Plus the best air conditioning in Davis! Meet by the main staircase. Four tours are scheduled, all from noon to 1 p.m.: Friday, June 29; Tuesday, July 10; Thursday, Aug. 9; and Wednesday, Aug. 18.